Hey everyone! It's been a while since I posted a review here on Emily's Anthology and I thought it was high time I get on it! Now when it comes to warm, humid weather, no people are better authorities on the subject than tropics-dwellers. Living in a tropical country myself, I am constantly searching for long-lasting products that look good on the skin, and summertime overseas means I get to share some of my favourite colours with you as well! Hankies in the background are from Innisfree's Eco-Hankie campaign - an environmental campaign encouraging the usage of hankies in place of disposable tissue. 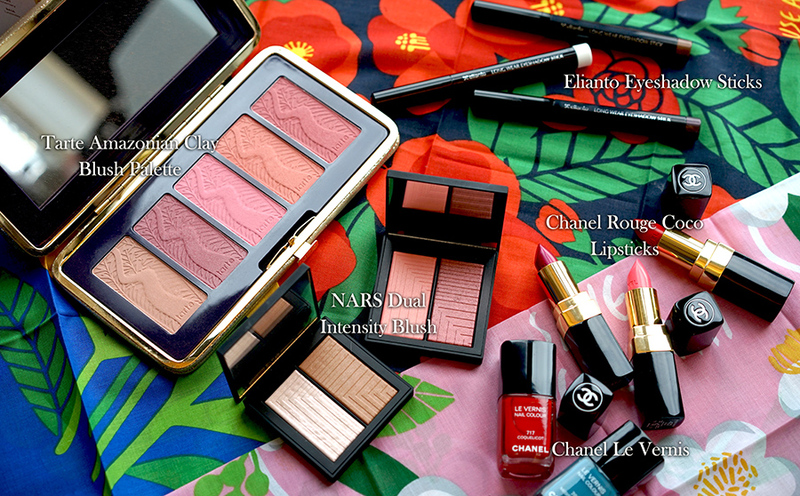 My first, most favourite is the Tarte Pin Up Girl blush palette, that holds 5 Amazonian Clay blushes. These blushes are both pigmented and long-lasting, and I've been using these non-stop since I got them. There are three matte shades and two shimmer shades, and all 5 of them are easy to blend and look lovely on the skin. My favourite by far is the peachy colour (fourth from left) because it enhances Asian/warm skin tones so beautifully! Also in the cheek category are these beautiful NARS Dual Intensity Blushes - the ones I have are 'Craving' (beige and brown) and 'Fervor' (peach and pink) - and these babies are incredibly pigmented and display the most beautiful sheen on the cheeks! Their shimmer is s incredibly finely milled that it doesn't show up as obvious flakes on the skin; instead you're left with this glow that looks dewy and healthy, plus an incredible, lasting colour. Try out the hot pink in the 'Fervor' palette - you will be pleasantly surprised. I always find that colours that look the scariest in the tube/pan are always the most flattering on the skin. These retail at RM191 per duo in NARS stores. The Elianto Eyeshadow Sticks are a brand new discovery, from a PR send-out that I only just received last week. Though the colours don't stay as pigmented throughout, they still last all day on the skin without creasing in the slightest. I would recommend popping these in your purse for an incredibly easy touch-up if you're spending the entire day (and night!) out. They're beautifully coloured and are really easy to blend, most times I just use my fingers to blend the edges! Last, but not at all least, Chanel. Chanel, oh Chanel! The lipsticks shown above are the incredible new formula of the Rouge Coco's (I'm sure you've all seen that sultry Kiera Knightley ad by now!) in some of my favourite colours - Emeliene (a magenta with a tiny bit of shimmer - so unique! ), Olga (a bright, coral-pink that really POPS), and Arthur (a classic, gorgeous fire-engine red that I just can't get enough of). They are so smooth, decently pigmented, and feel lovely on the lips. They're just pigmented enough that I can get away with wearing no lip liner on casual days, and look va-va-voom when paired with a lip liner underneath (try Emeliene with MAC's Night Moth lip liner - OMG!). Also on my list are the hot Le Vernis Nail Colours in Mediterranee (turquoise) and Coquelicot (tomato-red) - I'm sure you guys know the Chanel Le Vernis formulations are lovely, and the colours just scream summertime to me! I am in love with these beautiful products and I hope you get the chance to try them out this summer! 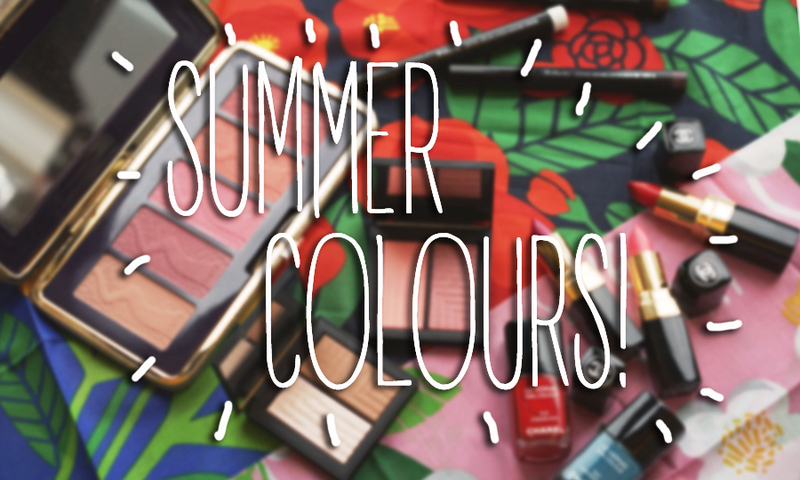 What are some of your recommendations for summer colour cosmetics?